Archangel Jeremiel, whose color is deep purple and whose stone is the amethyst. 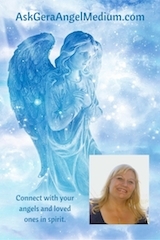 Archangel Jeremiel also helps us to do a life review, and make changes where necessary. Call on him when you are ready to change, if you feel your life has gotten off track and you want to get back to a place of love and compassion. If you feel the need for courage and strength to make changes, the angels will help you. Simply ask and they are there for you. They love us and they are here to serve.